Separation Anxiety: My Dog Won’t Stop Chewing! There are over 75 million pet dogs in the United States. Owning a dog is a lot of fun but it also can be incredibly challenging and involves a lot of responsibility. You need to make sure your dog is comfortable in your home at all times, is healthy, in shape, and well fed. Plus, you have to make sure they are getting along with other pets or members of your family, are training them correctly, and so much more. One aspect of pet ownership that you cannot ignore is your dog’s sleeping habits. Though 45% of pet dogs sleep in their owner’s bed, that’s not a great option for most dogs — especially as they transition into your home. Destructive chewing is a common occurrence in some breeds of dogs, especially when they feel uncomfortable, anxious, or bored in an environment. Your dog constant chewing items around the house can lead to plenty of homeowner stress, household damage, as well as lead to serious pain issues for your pet. Rather than neglecting these chewing issues, you need to address them right away for your pet’s sake and for your own. Start with purchasing a quality chew proof crate bed. Perhaps one day your dog will be able to comfortably sleep soundly at the foot of your own bed — great. But until then, in order to avoid chewing issues and damage, chew proof crate beds are a much better option. 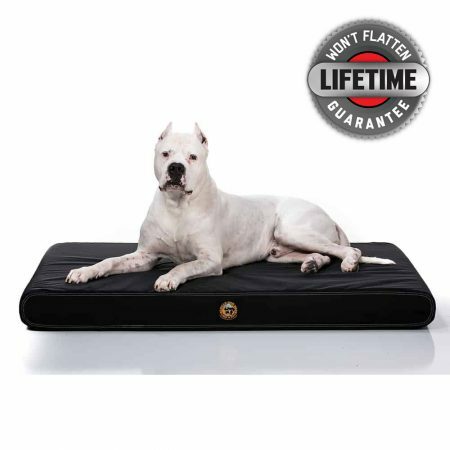 If you want to learn more about the importance of orthopedic dog beds and find quality chew proof crate beds for your pup, give Gorilla Dog Beds a call right away!